For my French friends - please note the book is available in English only. After the crucifixion Mary Magdalene was never mentioned again in the Bible. What happened to her? 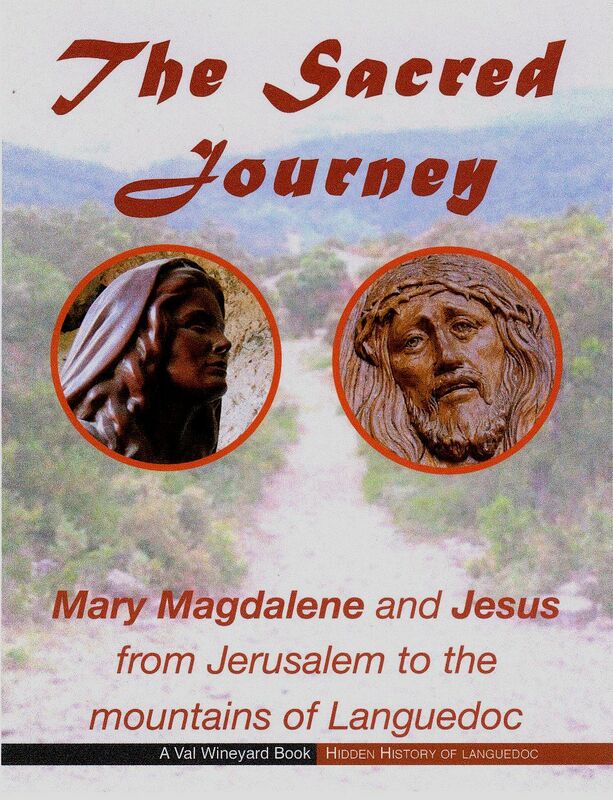 As I explain in my books, I think that Jesus survived the horrific ordeal of the crucifixion and he and Mary Magdalene fled to the south of France - to Languedoc, not to Provence. Some may find this idea new, but I have solid historical research to prove it; and so, I wrote a book. It describes the route I believe Mary Magdalene and Jesus took when the fled the Holy Land and travelled to safety in the Corbières. the tiny harbour at Fitou, where they landed. The legend that Mary and Jesus came to Languedoc after Jesus survived the crucifixion has been part of my consciousness for many years, ever since I first visited Rennes-le-Chateau in 1980. Over the years ordinary French people would either laugh at this legend or believe it, but they all knew about it. I knew the official Catholic legend of Mary Magdalene landing on the coast of Provence which she then converted by her preaching. But here in Languedoc it was insisted; Mary AND Jesus came to Languedoc. It rang true to me for I personally had believed for a long time that Jesus survived the crucifixion. One summer day when I was sitting having a beer at the small seaside town of Ste. Marie la Mer, on the Mediterranean coast a little to the north of Perpignan. The sunlight was glittering on the turquoise sea . . . could Mary Magdalene had come here? We went to see if the church was open to find its patron saint; but to my surprise it was dedicated to the Virgin Mary, not Mary Magdalene. I was so sure it would have been a Magdalene church. Ste Marie la Mer near Perpignan . 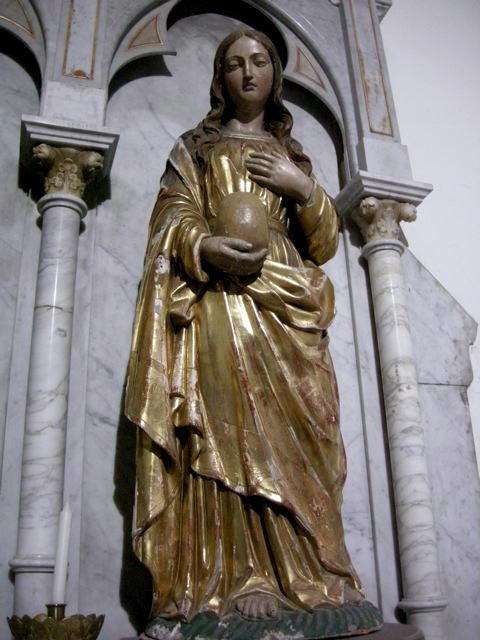 . . friend and researcher Jaap Rameijer found a statue of Mary Magdalene there, although the church is now dedicated to the Virgin Mary. 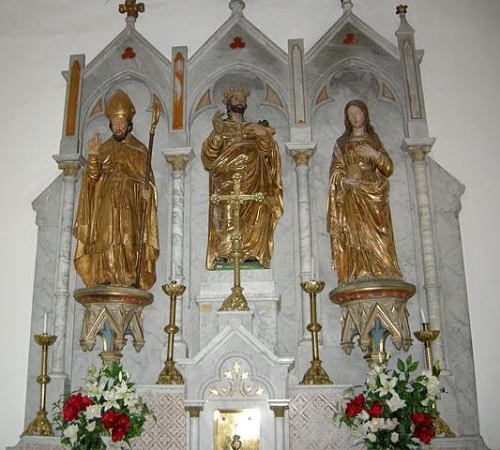 The statue was part of triplyche that included a bishop - could he have been St. Paul Serge? The dedication of the church at the seaside town of Ste. Marie near Perpignan had been changed in medieval times from the Magdalene to the Virgin. I was correct all the time. Many times along the route it seemed the allegiance had been deliberately changed from the Magdalene to the Virgin. Mary and Jesus landed somewhere on the French Mediterranean coast, that is clear - they came by sea. Places mentioned in Catholic mythology, ignoring the cult of relics that inspired these claims, include Marseille and Stes. Maries-de-la-Mer on the Camargue - NOT the village of Ste. Marie la Mer near Perpignan. So I reluctantly dismissed Ste. Marie la Mer as their landing place - but if not there, where was it? There is only one place along all the Mediterranean coast with a place or landmark called La Madeleine; I found it and like to call it The Magdalene Hill. 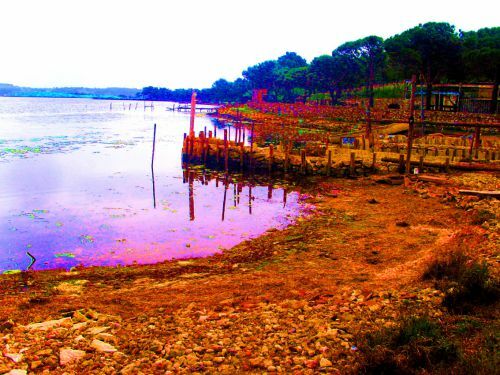 It is at the village of Fitou, which had a tiny port in Roman times. People arriving by sea at Fitou, perhaps with one or two servants, would have been able to buy supplies and donkeys or horses at the mansio - the stopping over place on the nearby Roman trunk road, the Via Domitia. I think that is what Mary and Jesus did. They would not want to linger long. My feeling is they sent their servants to deal with things as rapidly as possible, then quietly slipped away, up the hill to today's Fitou, then over the hill, on a minor Roman road. Freedom! 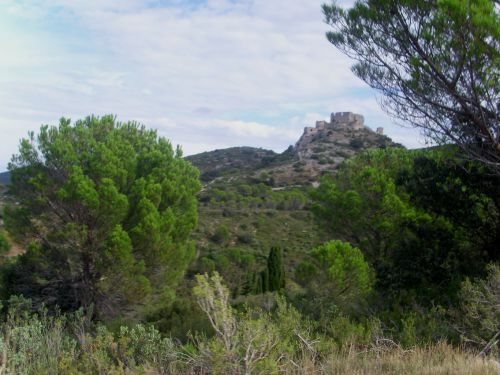 Mary Magdalene and Jesus crossed the Corbière mountains to reach their safe haven in the "land of the Rhedones" - that is, Rennes-le-Château country. The route I found was the shortest possible from the Mediterranean coast. I was told there were no Romans roads across the Corbières, but the whole region was a great area for Roman industry, especially mining, so the route I'd always suspected existed served the mining industry and later became the sailor's route from the coast to the Ariège, and then a Cathar route, especially when the Cathar Parfaits, under cover of darkness, were fleeing to Spain. Incredible wild countryside! This is the Cathar castle of Aquilar, that existed as a Roman watchtower in the time of Mary and Jesus. This well-established route, which began in Celtic times and was then adopted by the Romans, leaves me obliged to think someone had advised Mary Magdalene and Jesus as to the best way to go and the route to follow. Legends talk about boats being blown off course, but it was not coincidence that they landed at the shortest distance from their destination, I'm certain. They had friends in "high places." I explain who advised them to go where in my book Claudia Procula. She was a Roman princess who had been brought up in Narbonne, the Roman capital of Gaul at the time, and a secret disciple of Jesus. "The Sacred Journey" paints an incredible picture of what the Corbières were like in the time of Mary and Jesus. These magic mountains were part of the Roman Empire, and I have studied Roman roads with various historical societies to which I belong, while archeological research can tell us what existed 2000 years ago. So I know what would have been along the route in the time of Mary Magdalene and Jesus when they were there. I even discovered a Roman road - see the tracks made by the cartwheels on the bedrock? (My friend Jaap Rameijer took the photo.) And this was the third road, there is another one, renovated by archeologists, approaching Vingrau, and another unknown road approaching Bugarach. Travelling on foot or by horseback, with a pack animal and a handful of faithful servants, the journey would have taken them about ten days. You can walk that journey yourself with this book in hand. "The Sacred Journey" is an extraordinary guidebook, passing ancient Roman remains and pin-pointing the places that Mary and Jesus stayed. The country at the time was still Celtic; I traced the local "white lady" legends in the region, finding sacred places and sacred springs. 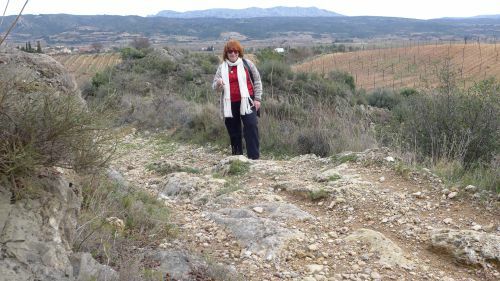 I explored the unknown Cathar tracks, listening to psychic and spiritual people who tell us what they saw along this route. The road passes ancient churches with Mary Magdalene memories (often well disguised) and it weaves around the feet of Cathar castles, belonging to the ancient religion that believed Mary and Jesus were married. Parts of this mountainous and magic countryside are so remote that we can see it as Mary and Jesus saw it so long ago. We can imagine their joy as they came to the crest of a hill and saw a green and verdant valley in front of them, where the villa of a friend was waiting to welcome them. With the detailed road-map instructions, the reader will be able to follow exactly the footprints of these two incredible people, who were starting a new life together in the green mountains of Languedoc. And who would one day become, in people's minds, a God and a Goddess. 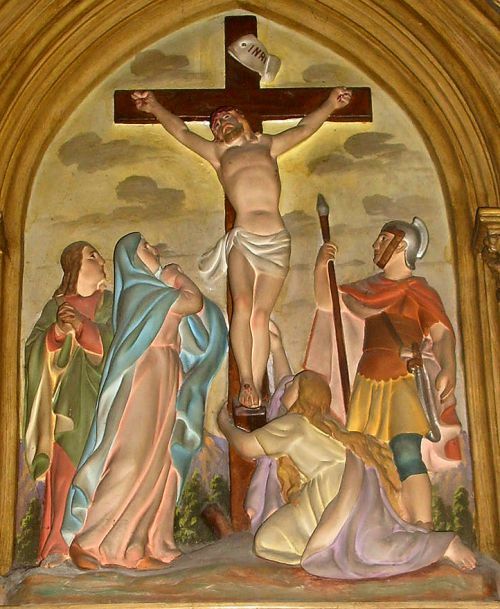 The crucifixion as seen at Tuchan, with Lazarus, Jesus's mother, Jesus with Mary Magdalene at his feet and the Roman soldier, Petronius. On this route you will find no great Catholic pilgrimage centres or cathedrals with expensive hotels next door - but you will find those secret sacred corners that will enchant your mind and maybe even your soul. (Maybe one day I will be a guide along this route for people researching Mary Magdalene. So if you would be interested in me as your guide, please write to me using the "Contacter Auteur" box below. Your message will go directly to me and not appear on the site.) This is my most popular book and has been re-printed three times. The book in the local shops here in France costs 15€50. It has 14 pages of colour photographs and then 150 black-and-white pages, well-illustrated, telling you about beautiful villages, sacred paintings, Cathar castles, unknown legends, and all the practical things like map details and tourist information. I sure enjoyed you taking special time to meet me and share a few secret places with me. Lucinda, California. If you prefer to buy using Amazon.co.uk, you can do so. Click here. If you are already living in France, you may prefer Amazon.fr. So - click here. Footnote; some people have asked me for the maps that I used to research the book, even though detailed instructions are given in the text. You can find the maps and buy them on; http://loisirs.ign.fr/top-25-et-serie-bleue.html The scale is 4cm on the map to 1 kilometre on the ground, brilliant for the detail.